Palm Pre: Can it Live Up to the Hype, or Will it Flop? It's official: The Palm Pre is hitting store shelves on June 6. In a blog post this morning, Palm announced the Pre would be available at launch at Sprint Stores, Best Buy, Radio Shack as well as select Wal-Mart locations. The Web-OS based Pre will retail for $200 after a $100 mail-in rebate and two-year service agreement, according to Reuters. Calling and data plans for the Pre were announced in March and range in price from $70-$190. The Pre's release will come just two days before citizens of Appledom take over San Francisco's Moscone Center West for Apple's Worldwide Developers Conference. Apple is expected to launch iPhone OS 3.0 during the conference and Palm is clearly hoping to take some wind out of Apple's WWDC sails. Palm and Sprint are likely hoping for iPhone-style lineups and fan frenzy on June 6 at Sprint Stores and other retailers around the country. While Palm's willingness to go toe-to-toe with the iPhone is admirable, audacity like this doesn't always pay off. A certain smartphone maker based in Waterloo, Ontario, Canada was also hoping its own iPhone killer, the Blackberry Storm, would bowl over consumers and "Storm" its way across the iPhone horizon. In the end, however, critics from all corners panned the Storm's buggy software and bizarre touchscreen/physical keyboard hybrid, called Truepress. Since then the Storm's maker, Research In Motion has tweaked the Storm's firmware and is rumored to be working on a second Storm device. In all likelihood the Pre will fare better than the Storm since the Pre's early reviews have been very favorable. But few have been able to get their hands on the Pre since January's Consumer Electronics Show where the Pre debuted. During CES, PC World had some time with the Pre and first impressions of the device's hardware left a lot to be desired. However, Palm did say the Pre's physical design could be tweaked before launch. 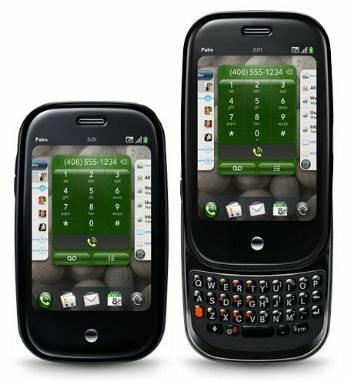 There's also the question of Palm's brand new WebOS, which is debuting on the Pre. Again, early reviews were positive but it's hard to know how the final product will hold up against competitors like the iPhone OS and Google's Android platform. Palm is also investing in an iPhone-style software development kit for third-party developers to create applications for WebOS called the Mojo SDK. It will be interesting to see how Sprint's app store and development community compare to the iPhone and Android versions. The Mojo SDK launched in April, so I wouldn't expect a flood of apps for the Pre anytime soon. The Pre itself, however, is coming June 6 when a lot of questions surrounding this over-hyped device will finally be answered.